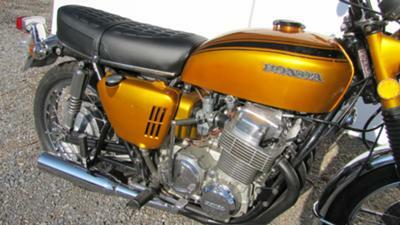 The 1969-1970 Honda CB750 KO for sale was built Nov 1969. It has new OEM Candy Gold paint, a new OEM Seat assembly and a clean gas tank with no rust. 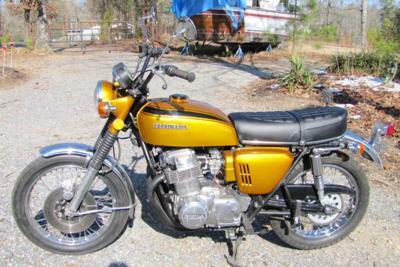 This CB750K is in very good to excellent condition. 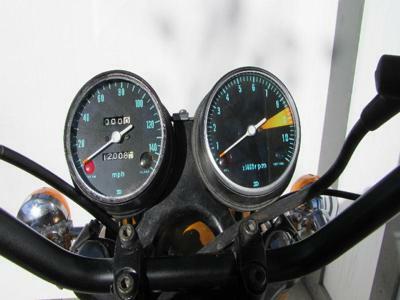 All electrics work correctly, no broken turn signals/stays, levers, switches, gauges, etc. all in proper working order. Brakes work very well, tires in good condition, wheels are true and straight (we broke them down to polish everything and “trued” when re-laced). Bike has been gone through completely in our shop, fresh top end and tune up as pictures will show. All work performed during the months of August – December. We have more pictures available in high resolution. 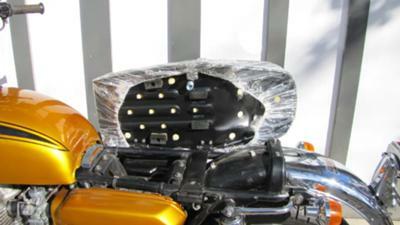 Completely stock Honda – seat (new), wire wheels, gauges, handlebars/switches, chrome fenders, etc. all in very good condition with only 12,008. original miles. -Complete tune up, plugs, oil change, etc. We held a Honda motorcycle franchise for 22 years, 1961-1983. This 1970 CB750K is one from our personal collection, owned since June 1997 to present, stored inside our showroom. It was purchased from the second owner who bought it in June of 1975. The title is ‘free and clear of all Liens”. We are located 18 miles SW of Hot Springs, AR. and you are welcome to view this in person and pick up locally. Please email me your questions and offers using the space below that has been provided by GoGoCycles Used Honda Motorcycles for Sale (and PLEASE do not neglect to include your contact information in your email or to provide a phone number or email address if you leave a message!) so that I can respond with answers to your questions or after consideration of your best offer as quickly as possible. You won't find a nicer 1969 or 1970 Honda CB750 KO or sale on Craigslist or Ebay so hurry and make an offer before it gets away from you! GoGoCycles would also encourage bikers to submit a review of the 1970 Honda CB750 KO for Sale for sale to make the biker community aware of any problems that are common to this vintage Honda motorcycle or to highlight its positive features and help potential buyers make informed decisions.